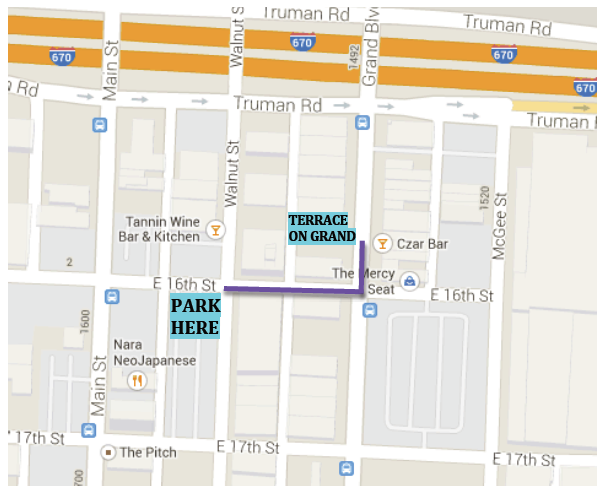 The Terrace on Grand opened its doors in December 2008 and is conveniently located at 1520 Grand Boulevard in the heart of downtown Kansas City. The Terrace On Grand offers 5,000 feet of classy, urban, indoor event space, accentuated by the most exciting roof deck in Kansas City. Blocks from the Sprint Center, KC Power & Light Entertainment District, Kauffman Center for the Performing Arts, and Kansas City Star building, Terrace On Grand gives you a vibrant 360-degree view of downtown Kansas City. The Terrace on Grand Kansas City’s contemporary, elegant, versatile event space will provide the ideal backdrop for your next special event. Our unparalleled style, service and amenities are guaranteed to make any event a success. The Terrace on Grand can best be described as an “urban loft space with class”. With a 360-degree view of the Kansas City skyline, state of the art lights and sound, baby grand piano, a reserve wine and champagne wall, and safe easy parking, The Terrace on Grand is not to be missed. Our unparalleled style, service and amenities are guaranteed to make any event a success. We are happy to accommodate you with any upgrades to your bar or dinner service. Terrace on Grand’s in-house catering company, Taste KC Catering, is a first class, on-site catering company offering endless options for your event. Our all inclusive package will include a five (5) menu item buffet including your choice of two entrees, one vegetable, one starch and one salad with dinner rolls. Buffet packages also include china, silverware, and linen napkins. CLICK HERE to see the buffet menu options as well as upgrade options and appetizers. Quotes available for plated meals, desserts, and vegetarian or gluten-free dishes. Terrace on Grand does allow outside caterers and will reduce the package price by $18.00 per person. Outside caterers must be licensed and insured, will be required to help with any room flip including the setting of tables with china, flatware, and linen napkins. Outside caterers must also provide staffing for bussing for the entire event. $750 Kitchen Fee Applied. The Terrace on Grand has a fully stocked bar as well as a wine and champagne wall. All alcohol is required to be provided by Terrace on Grand. Liquor: Grey Goose Vodka, Bacardi Rum, Captain Morgan spiced rum, Tanqueray gin, Jack Daniels whiskey, Glenlivet scotch, Patron Silver Tequila or comparable liquors. Stand-up receptions for 25 to 260 people. Seated dining can accommodate 220 people. You can reserve a date for the Terrace on Grand with a signed rental agreement and a deposit of one-third of the all inclusive package rental charge. A final planning meeting will be held 21 days before your scheduled event date. At this time, we will confirm your guest count, room layout, event schedule, menu, bar, rentals, and vendor list. Final payment is due at this meeting. We are happy to set-up a private tasting once you book your date. You may set-up a tasting before booking a date for $75.00 fee, which is credited back to your account if you end up booking a date at Terrace. You may pick up to 8 items from our menu items for up to 6 people for your tasting. CLICK HERE to see the buffet menu options as well as upgrade options and appetizers. The Terrace on Grand has many options for ceremonies. Typically ceremonies are held in our indoor space on the 3rd floor. Guests are invited to go to the rooftop for cocktail hour, weather permitting, while the room is set for the reception. There is a $1,000 ceremony fee which covers the additional labor involved with the room change over. It also gives you an additional hour on your room rental and an additional hour for a rehearsal. Rooftop ceremonies require chair rentals since they cannot be brought down afterwards for the reception. Ceremony rehearsals are usually done the night before unless there is an event already booked. We ask that you be flexible on your rehearsal time since we cannot guarantee the evening before will be available. Click here to view information about our packages and pricing.